This is a follow up to So my Yosemite install is slow - what to do? Since installing Yosemite a week or so ago my machine is very sluggish. I am a web developer so I change windows/apps a lot. Changing apps makes my machine hang for 2 or more seconds. After observing the Activity Monitor I can see that WindowServer is taking up a lot of CPU when I move windows and also when I am just using one app. I have tried closing apps to determine which, if any, is causing the issue but haven't come up with anything useful yet. Even right now as I type is flips between 10% and 20% usage. I am only typing! I had a similar issue with high cpu usage in WindowServer which I managed to get back to something more normal by removing any items in my menu bar that were making high frequency drawing updates. In my case it was the Network Monitor from Little Snitch that seemed to be the biggest culprit. Reduce transparency effects (it's in System Preferences > Accessibility under Display). I've tried this, it might improve the performance but I was missing the look so I've switched it back. Switch off automatic graphic switching (System Preferences > Energy Saver). This was the best option for me, as I don't really worry about energy consumption, but honestly I don't think that there should be a real need for this. I'm not yet aware of a real solution yet, let's hope that Apple will fix this in 10.10.1.
edit: I've updated to 10.10.1 and the issue still persists, so I guess we will have to wait longer or go with the reinstall. edit 2: Switching to El Capitan has vastly improved this, so for me, this is no longer an issue. Hi, try this: Disable the "Display have separate Spaces"
Somehow my user preference file, com.apple.sidebarlists.plist, had acquired several keys with very long values (all named Bookmark); the lengths ranged from about 2.7 MB to 4.3 MB which made the size of the preference file larger than 11 MB. It appears that whenever an operation occurred that needed to access the (sequential) preference data from that file, reading the entire file brought everything to a near standstill until complete. (When I was looking at the file with an editor I experienced the same slowness in moving through the file.) Removing that file has eliminated nearly all the slowness that I was experiencing since switching to Yosemite and continues to do so. I do think we're dealing with several different issues that are causing Yosemite to slow down and any of us may have one or more of these issues. I'm still seeing long dumps of trackpad gestures in my system log which I had felt was the cause of the slowness but now appears to only slow things down at certain times (as well as cause Firefox's scrolling to fail) after using Firefox for a while; the rest of the machine seems back to it's normal speed. If anyone finds the same thing and, if so, removes this preference file then it would be good to either validate or invalidate this as a possible cause since the solution is so seemingly elusive so far. This change has made such a dramatic difference in using Yosemite for me that I hope this is a solution for many others suffering from the slow down since upgrading to Yosemite. My machine has the same problem, what I did is uninstall the Google Chrome, and then everything goes smoothly. 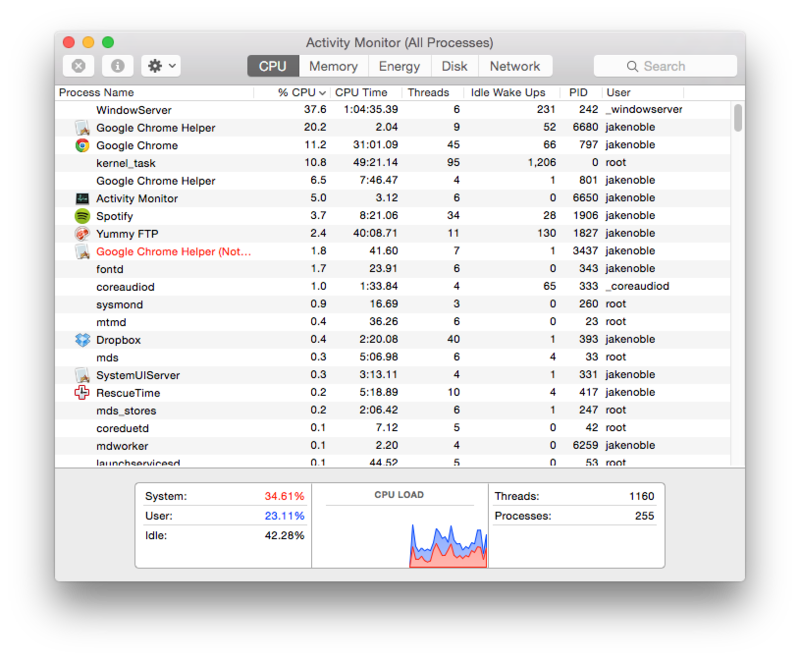 CrashPlan Tray is definitely one culprit for high CPU usage. 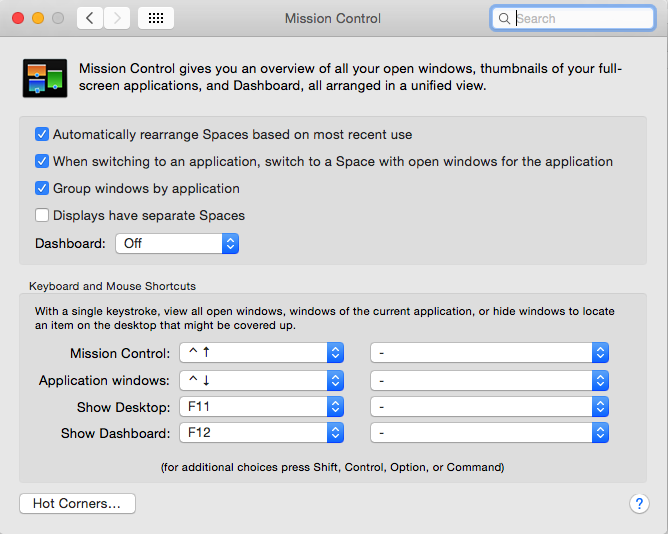 It helps to disable animations in the tray preferences. But it still did not solve the problem for me. The only thing that solves it for perhaps a week seems to be a full reboot. After that the machine simply becomes sluggish, and needs to be rebooted. Back to Windows95 yay! Apple should do something about this – but no, the problem seems to have been around forever. At least they should provide instructions/application to debug this and find the external culprit, if it is an external application. But I'm increasingly beginning to think it is is mainly WindowServer getting tangled up with itself, exacerbated by other applications' task bar updates etc. I used to experience this problem, until I upgraded to OS X 10.10.2. Now I can go for weeks without rebooting, and the window animations will stay smooth, and the WindowServer process will not use a lot of CPU. As mentioned by most of the answers, it may be due a menu bar item of yours.. I was experiencing the same behavior and removed iStat Menu bar as well as Little Snitch and after that the situation improved significantly. Not the answer you're looking for? Browse other questions tagged macos yosemite performance . So my Yosemite install is slow - what to do?